It takes about 3 days after enabling climateprediction before it is the only thing running on my PC. SETI and Asteroids locked out. What am I not doing apart from deleting it entirely ? next step. Message 57292 - Posted: 2 Nov 2017, 11:30:09 UTC - in response to Message 57291. It is to do with the length of the CPDN tasks and the resource share allocated to each project. 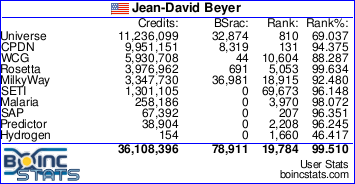 BOINC manages this fairly well with projects that have tasks lasting only one day or less. With tasks that can on some systems last weeks if not months it struggles to do so. If left long enough each project will get their correct share still but we are talking weeks or months for this to happen. The other alternative which some do is to micromanage things by suspending some tasks to allow others to run. I don't worry too much as I only run non CPDN tasks when I can't get CPDN work. Message 57617 - Posted: 12 Jan 2018, 5:47:51 UTC - in response to Message 57291. I have boinc set up so that climateprediction gets 1/2 of the spare time on my 4-core machine. I used to get lots of work-units, and some took several months each. Often three of the four tasks running would be climateprediction. But now none of them are, and this has gone on for so long that new my recent average credit has dropped to zero. Message 57618 - Posted: 12 Jan 2018, 8:47:11 UTC - in response to Message 57617. But now none of them are, and this has gone on for so long that new my recent average credit has dropped to zero. There is a problem with the WAH2 tasks that if they have one type of forcing enabled they inevitably crash just before creation of the first zip under Linux and Mac operating systems. Tat is why there has been no work for these machines for so long. This was exacerbated by the fact that under pre 7.8.3 versions of BOINC a limitation on the file size of the event log resulted in these crashes wiping out other projects running on the machine as well. This happened with tasks that produced more than a certain number of zips which then went into the event log as missing when it tried to upload them after the crash. (It was possible to get this back by manually editing a couple of files to remove every reference to the crashed task but this was laborious to say the least.) The project people made a decision to not send any more Linux and Mac tasks till this has been resolved. There was a batch in the testing programme to try and fix this but on both my machine and at least one other they still crashed so it is back to the drawing board. In the meantime this machine is now running tasks under WINE but since I made the swap, there hasn't been any new work even for Windows machines. There is usually a work drought this time of year. Most of the colleges and universities that commission the work have been (and some still are) on their holiday or between semester breaks. It should end is a week or two.